For many artists living and working in Humboldt County, no matter their style or medium, the diverse natural beauty of this place inspires passion. Temperament and craft play their part in the approaches the artists interviewed here take in expressing their environs, be it town or county, with results that are as varied and striking as the unique scenery they evoke. The photographer Rick Gustafson demonstrates his enthusiasm for our local landscape with a solo show, Impressions of Imagination, The Art of Landscape Blur, at the Morris Graves Museum. 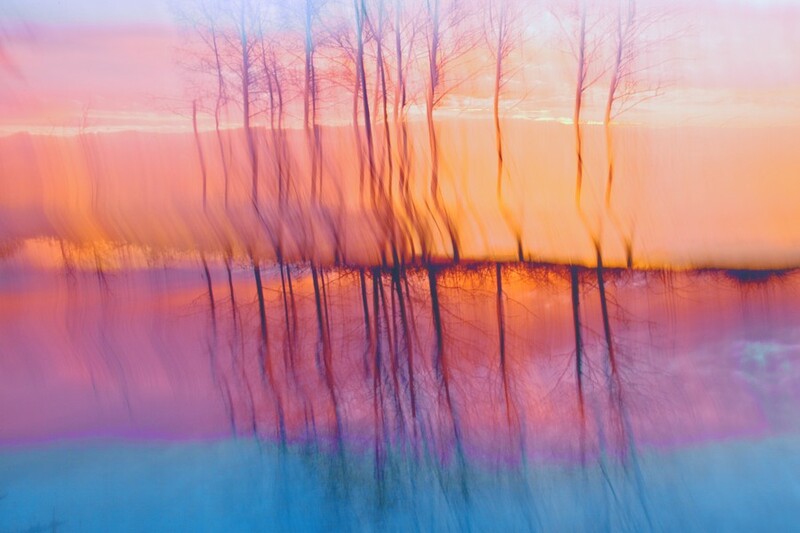 The somewhat fleshed-out title for this show is Rick's attempt to introduce a larger audience to his way of working and make us aware that there is a school of photography known as "photo impressionist" or "landscape blur." "At first glance, everyone assumes that the blur effects in my work are produced in Photoshop or some other digital program," said Gustafson. "But all of these effects are achieved solely with physical camera manipulation and in-camera filters. I spend far more time in the field than on a computer. The immediacy of responding to the total presence that I'm in is akin to what a painter experiences. Essentially, I'm painting with a camera." In one of my favorite Gustafson photos, Water Colors, the blur effect was achieved by throwing a rock into a reflection on water! 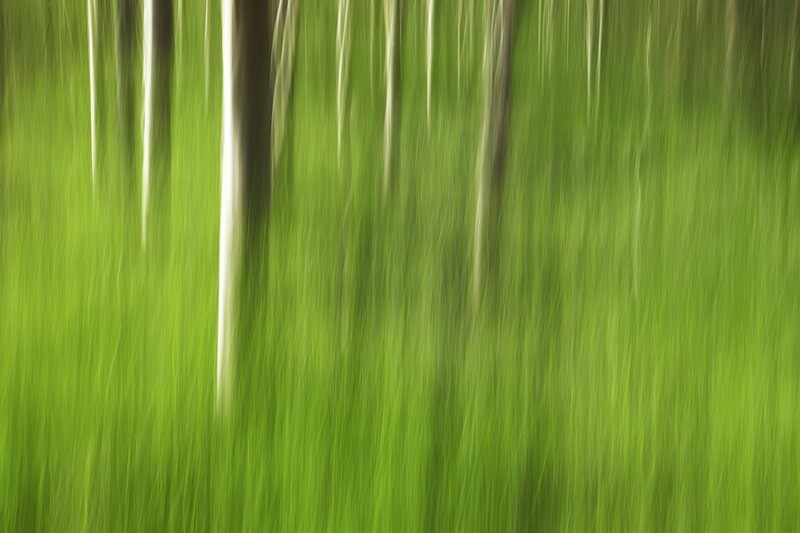 Most of the images in the show are from his portfolio A Walk in the Forest, with a focus on trees in the landscape. "I've got a few favorite spots such as Lost Man Creek in Redwood National Park that never fail to fill me with awe and make me want to capture the grandeur and splendor of the light and forms in an impressionist way." This is relatively new territory for photographers as well as viewers. Our ability to appreciate or even tolerate blur in a medium so admired for its "realism" is an acquired and growing esthetic. Gustafson's dedication has propelled him to study with the eminent impressionist landscape photographer William Neill, as well as honing his painterly skills with Becky Evans. The show marks a seminal period in his ongoing invention of original processes and his meticulous care with every aspect of printing and presentation (including an excellent website). Summing it up, Gustafson exclaims, "I just feel so privileged on one of our clear mornings to be in a spot like Murray Field, able to render a fleeting moment with movement." Rick Gustafson's show at Morris Graves Museum runs through Dec. 10. Reception for the artist: Nov. 5 Arts Alive! Contemporary realist painter Kathy O'Leary seems to love all of California, but she calls Eureka home. O'Leary's exhibit of paintings at Piante Gallery is her first solo show in years. Many of the works are winning depictions of local landscapes. "As a landscape painter, I do feel especially blessed to be here and have this incredible subject matter all around me that gives me endless images to paint." The show is fittingly titled Earth Tones, which offers a clever clue to the kind of overall atmosphere the viewer experiences. The paintings are not about terracotta hues but the full range and vibrancy of all the colors and tones of the earth. "Although I've long admired the work of such painters as Henry Percy Gray, it's taken me a while to see myself as a tonal painter. But if I objectively look at my work, I realize I do have a lot in common with that fine tradition. Rather than emphasizing the brightest brights or darkest darks, I play up the middle tones and pull away from any sense of photographic precision. My aim and meaning is carried by design and atmospheric effect. 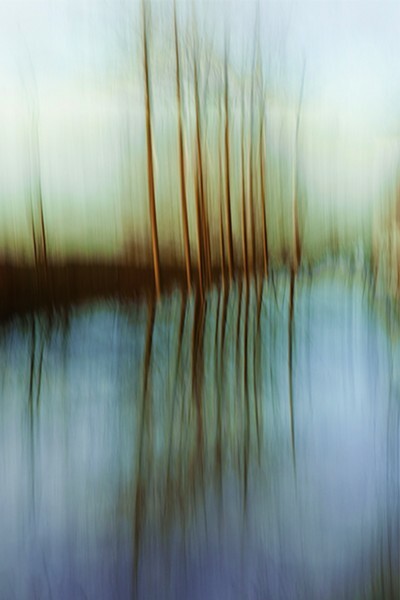 I love to look through trees and lead the viewer to pause before tranquil vistas and luminous skies." 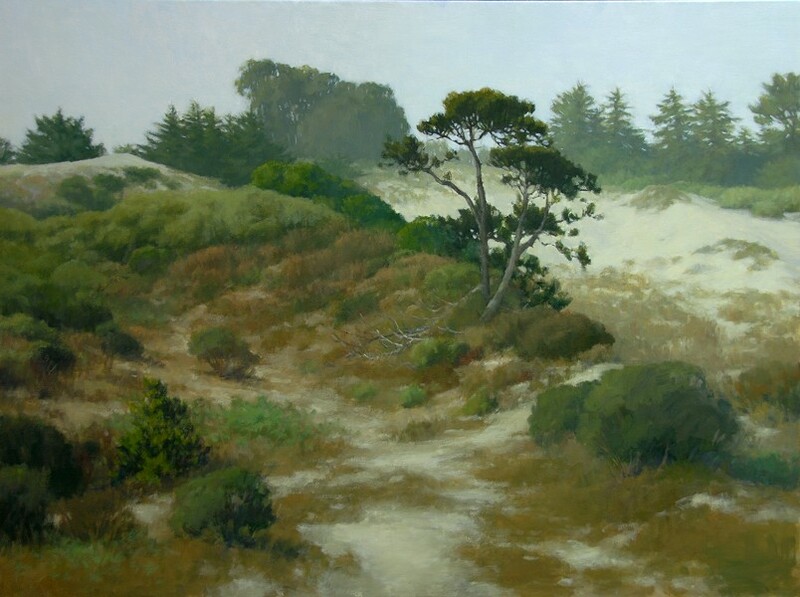 In one large triptych, a depiction of Indian Island, Kathy succeeds with all of these elements of fine painting to leave us with an experience greater than the sum of its parts, as subtle as the temperature of the very air and as delicate as one of Humboldt's bright, diffused, gray days. Expect a lively reception for the artist at Piante Gallery: November Arts Alive! 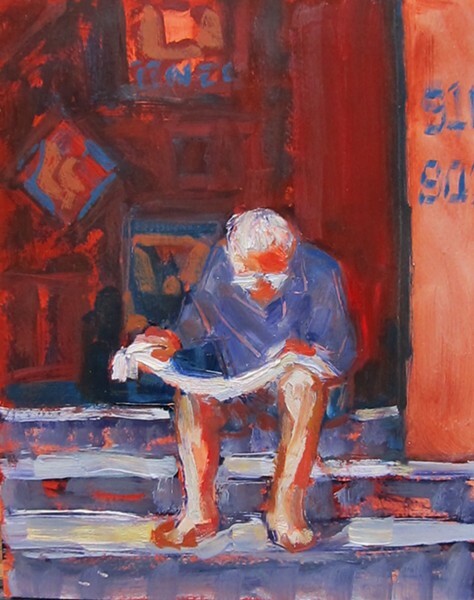 Sewell Gallery features Linda Mitchell in November, an artist who, as is often said, needs no introduction. Her fascinating show is titled All Within a Mile, and since she lives in the heart of Eureka, the work is very local. "I do a fair amount of traveling. When I come home, I look forward to encountering familiar sights, knowing I can wait for the light or weather condition that will allow me to paint them with renewed affection and experiment with new color pallets," said Mitchell. 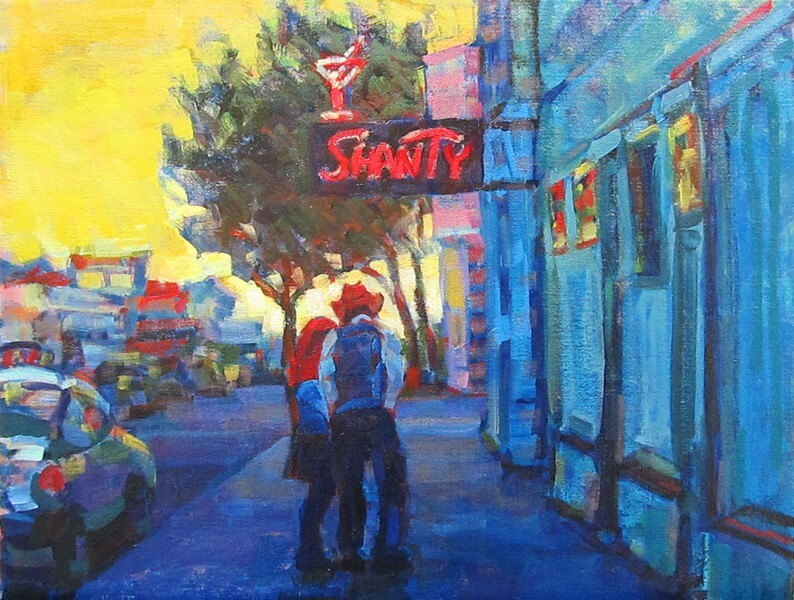 Mitchell's new oil paintings for this show offer a fresh take on some of Eureka's iconic places: The Shanty, Brick and Fire and E Street -- all within walking distance of her studio. "A pure landscape doesn't do that much for me. I need a building, a boat -- some manmade element to spark my engagement," she said. "The scale and variety of the buildings of Eureka's Old Town enlivened with the energy of the people going about their pleasures and chores is an endless source of inspiration for my art." Definitely a must-see, and a great way to experience a sense of place this Arts Alive!